I find it hard to resist a book with a minaret on the cover. Throw in a snake, fonts with clawed feet and other hints of the arabesque, and the book is guaranteed a rent-free existence on my bookshelf for the rest of its days. Musharraf Farooqi's Hoshruba, a translation of Tilism-e Hoshruba , the mid-nineteenth century Urdu epic fantasy by Muhammad Husain Jah (d. 1899), offers all these inducements and more. It has sorcerers, beautiful women, demons, kettle-drummers, paradisiacal gardens, beautiful women, lovers, wars, poem fights, beautiful women, magical devices, daring escapes, bazaar scenes, beautiful women, and of course, the promise of sequels with more of these very things. Twenty-three more volumes in fact, if the Urdu Project has its way. The tale's origin story deserves a volume all its own. In the city of Lucknow in northern India, in the 1840s, a group of oral storytellers led by Mir Ahmad Ali spun a tale, Tilism-e Hoshruba , that eventually got transcribed, edited, and quarreled over by a series of writers, most notably Muhammad Husain Jah and Ahmad Husain Qamar, and which more than a century and a half later grabbed hold of a gifted translator and author by the name of Musharraf Farooqi and instructed him to speak of the tilism of Hoshruba. Hoshruba is a magic realm. Though "tilism" is an Urdu word that originally meant "magic artifact," after the Tilism-e Hoshruba , tilism became a generic term for "magical realm." This transmutation of meanings is one of the work's more remarkable achievements. I have a feeling the word is about to be borrowed by the English language. The plot is complicated, but not complex. Afrasiyab, Lord of the Sorcerers and Emperor of Hoshruba, has given sanctuary to the false and vain God Lord Laqa, "an eighty-five foot tall pitch-black giant" with a head that resembles the "ruins of a palace dome" and limbs the size of "giant tree branches." Lord Laqa's mortal enemy is Amir Hamza, commander-in-chief of the True Believers. But the tale is not really about Laqa and Amir Hamza. Rather, it is about Afrasiyab and his nemesis Amar Ayyar, a trickster and a close friend of Amir Hamza. Amar Ayyar chips away at Afrasiyab's power, killing his sorcerers, subverting his confidantes, stealing his property, humiliating him in public, and trapping him in painful choices. This pattern of matching heroes with villains of equal status is repeated at lower levels, so that taken as a whole, the innumerable fights, betrayals, robberies, insults, and dilemmas acquire a certain fractal quality. The nature of the quest is also remarkable. In most Western fantasy quests, the sources of magic are left intact. But in the Tilism-e Hoshruba , the long-term goal is not to destroy a particular manifestation of magic, but to destroy the source of magic itself. But what is the source of magic? The Iranian scholar Seyed-Gohrab argued that Persia was "the ancient fountainhead of magic and wonders in Western literature." As he points out, the word "magic" is derived from "magi," the term for a Zoroastrian priest. Since Urdu evolved in part from Farsi, a quest to destroy magic in an epic Urdu fantasy could be seen as one of those Freudian facts crying out for a couch and a goatee. But as Farooqi makes clear in his introduction, Hoshruba is very much in Hindustan. The tilak-adorned, skull-necklace wearing, saffron-clad sorcerers of Hoshruba with their amulets and sacrificial fire rituals resemble Tantric sadhus more than Persian magi (pages 72, 310). There are references to the practice of sati in Hoshruba (p. 318); the women wear saris (p. 72); and at one point, Amar Ayyar even disguises himself as a Brahmin (p. 141). However, I do not think the storytellers meant to imply that Hoshruba was a prototypical kingdom of the Hindus. The images would suggest a familiar "wrongness" to their largely Muslim audiences, but they have a jihadi appeal for Hindus too (for example, the sorcerers use lard in their oblations, something quite unthinkable for a Hindu). The animus against magic has a different motivation. In an inversion of Clarke's dictum, magic in Hoshruba is sometimes indistinguishable from advanced technology. For example, Afrasiyab employs a magic claw to pick people up and transfer them from point A to point B; it is not unlike the ship-snatching Claw of Archimedes that was supposedly the bane of the Roman navy during the Second Punic War (214 BC). In Hoshruba, sorcery is as compulsively ubiquitous as electricity. Magic allows the tilism to be a place where books can foretell events, a place where death is rare enough to provoke declamations by heavenly voices, and a place where creating things ex nihilo is the norm, not the exception. When Amar Ayyar is captured and tied to a tree in the garden, it is not enough. The garden must also be isolated by a magic cordon, as if Hoshruba has no faith in mundane fabrication. Of course, Amar Ayyar is able to escape, as he always can, because Hoshruba's magic has no protection against his bag of tricks, just as Nature's mysteries have no protection against human curiosity. Indeed, the theme of Tilisim-e Hoshruba concerns what the sociologist Max Weber described as the "disenchantment of the world" (1904). Weber was referring to the cultural consequences of the Protestant ethic, but Islam's rigorous monotheism and commitment to the good life, in both senses of the word, seems to have had a similar effect. In this epic, getting rid of magic is a good thing. The true believers have no regrets whatsoever. What the true believers believe is that there's no need for sorcery. If technology is indistinguishable from magic, at least in the ambitions it affords, then what need for magic? What happens to the sorcerers in Hoshruba is not very different from what happened to sirens, sailing ships, and swordfights. Of course, a story this vast hunts many hares. Unfortunately, notwithstanding Muhammad Jah's protestation that the narrative has been written "with an eye to brevity" (p. 389), brevity is not one of those hares. Good guys are repeatedly trapped (never the good women), good guys repeatedly rescue other good guys, bad but beautiful women convert to Islam and are saved, and as per usual, the ugly ones rarely catch a break. That's especially true of sorcerers. About the time the umpteenth sorcerer got dispatched, I was reminded of Kurt Vonnegut's comment that reading a long novel is "like being married forever to somebody nobody else knows about or cares about." Perhaps the most intriguing aspect of the plot is how the good guys simply can't wait to return to Hoshruba. I can sympathize. For one thing, Hoshruba has gardens, music, books, and uncensored women. For another, it has Emperor Afrasiyab, lord of the sorcerers. As Farooqi remarks in his introduction, he is easily "the most interesting and complex character." True, most of the other characters are just plot ciphers, so it's not much of a contest. But Afrasiyab could hold his own even in comparison with other great villains of epic fantasy. He has a deep faith in words; Afrasiyab consults books for the right action and his response to personnel problems leans more towards inspirational epistles than beheadings. He is sensibly cautious of his wife, the formidable Heyrat, and cautiously sensible about his wife's sister, Bahar. He may be in love with Bahar, but it's in a classy, ghazal-and-terraced-gardens kind of way. When he weeps, he sheds genuine roly-poly tears, not the fake oily ones minor villains like to affect. Afrasiyab is going to lose, and he knows he's going to lose because the books tell him he's going to lose—and yet. Fantasies become epics, I think, when their villains acquire this state of grace. Tolkien's Lord of the Rings falls short in this regard because its chief villain is an abstraction, not a living breathing person. In contrast, the Ramayana is an epic because its great villain, Ravana, has enough personality to fill ten people. Here too, despite all its narrative flaws, Tilism-e Hoshruba is that scarce thing, a genuine epic. Actually, Farooqi makes an even stronger claim. The book's cover declares it to be "the world's first magical fantasy epic." This is an astonishing claim, even a bizarre one. What about the eleventh-century Irish epic, The Tain ? It's mostly prose, has good guys and bad guys, plenty of magic, is tediously long, and has enough declamations to please a tribe full of Yeats. Or what about Malory's Le Morte d'Arthur (1485)? Or what about the seventh-century Sanskrit text Brhatkathaslokasamgraha ("King of the Sorcerers") by Budhasvamin? True, it's in verse. But so what? Everything in Sanskrit is in verse. If length is the issue (the back cover describes the Tilism-e Hoshruba as "the world's first and longest magical fantasy"), then clearly the tenth-century Tibetan epic King Gesar is champ; it is estimated to have over one million verses, enough to fill one hundred and twenty-odd volumes. 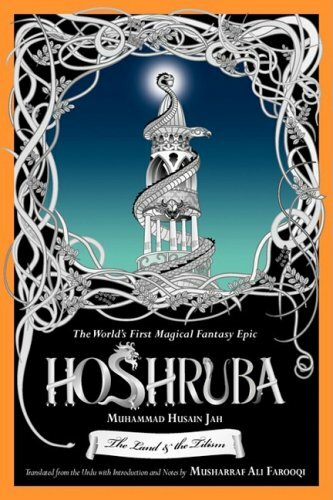 But if stories are disqualified because they are cast in verse, or because they are not long enough, or because they were/are believed by some to be factual accounts, or because their structure resembles a net rather than a fishing line, then yes, the Tilisim-e Hoshruba may be the world's first magical fantasy epic. In 1992, famed Urdu writer and national treasure Qurrutulain Hyder had made an analogous claim about Hasan Shah's Nashtar (circa 1800 C.E. ), a work she'd translated from Urdu into English. She claimed that Nashtar was the first novel in any Indian language. The fact that she'd translated an Urdu adaptation (circa 1890 C.E.) of Shah's Persian work was a minor detail, as was the existence of Pingali Surana's seventeenth-century Telugu work, Kalpurnadayamu . What explains this need to privilege works in this manner? Perhaps it's because Urdu, like my mother tongue Malayalam, is a relatively recent Indian language, not more than three hundred or four hundred years old. In a land where languages abound, a little attitude can't hurt. Or perhaps it's because when you highlight a language, you also highlight the neglected contributions of a people. In a famous essay discussing the situation of the Urdu writer in India, C. N. Naim remarked: " . . . writing in Urdu in India is now definitely a political act. It may not empower you much, but it still lets you assert the fact of your existence." Actually, I think the Tilism-e Hoshruba is indeed privileged, but not in the way Farooqi imagines it. It is not the first magical epic fantasy. It is the last of its kind, composed in the shadow of a new tilism, the British Empire's mercantilism, and all that it entailed. Tilism-e Hoshruba is the last of the great transcriptions of an oral narrative epic. Throughout the tale, it is possible to discern in the text, in the dim background, reified from our deep memory perhaps, the presence of a daastangoi —an oral storyteller—pausing, elaborating, grimacing, shifting voices . . . To modern sensibilities, the daastangoi's plot is tedious, the quests dubious, the heroes flat and perhaps even a little insane. But only to modern sensibilities. By himself, a daastangoi is only the sound of one hand clapping; an audience is required to complete that sound. And the sad truth is that the daastangoi's audience has mostly disappeared. The humid night, the cramped circle of friends and relatives, the gurgle of the hookah, the cousin who is always late, the whispered catch-up questions, the delighted laughs, the still-listening kids fast asleep in their parents' arms . . . that world has long disappeared. And with it has disappeared the Hoshruba as Mir Ahmad Ali and his friends told it, the Hoshruba as Muhammad Husain Jah wrote it, and the Hoshruba as the publisher Naval Kishore wished it read. What we have here in Farooqi's Hoshruba is something very different. Borges credits Chesterton with the insight that FitzGerald's Rubaiyat was "both an elusive melody and an enduring inscription." So too with this book. What eludes us is a forgotten piece of our tessellated selves, and Farooqi's magnificent effort to retrieve it will endure. And who can tell how things will turn out when the telling is still incomplete. Mahmood Farooqi, Himanshu Tyagi, Dan Husain and others have committed themselves to reviving the art of the daastangoi. The audiences are returning. Hoshruba may rise yet again, ready to re-enchant the world. I'm glad to have this book adorn my shelves. It deserves a place on yours, too. Anil Menon worked for about nine years in software R&D worrying about things like secure distributed databases and evolutionary computation. Then he shifted to a different kind of fiction. His stories can be found in magazines such as Albedo One , Chiaroscuro , Interzone , Lady Churchill's Rosebud Wristlet , New Genre , Strange Horizons , and anthologies such as TEL: Stories , Shockwave , and From The Trenches . He was nominated for the 2006 Carl Brandon Society's Parallax Prize and the 2007 Million Writers Award. His YA novel The Beast With Nine Billion Feet (Zubaan) is scheduled to appear in Fall 2009. This book looks fascinating. Great review. I'm sold. Great review. I loved Farooqi's version of the Hamzanama and I've been looking forward to reading this. Jeffrey, Aishwarya: Thanks for the thumbs-up. And cool blog, Aishwarya. Liked your reviews too. Was searching online to see if the book was out yet, and came across this review. Really well written; I appreciate the end message in particular. A fascinating and insightful review. I agree with you, that the origin of Hoshruba is in itself a story worth telling. Thanks for providing a greater context where you challenge the notion that this is the first and longest fantasy...I would like to now also read Bhratkhatashlokasamgraha. I bought Hoshruba a couple of months ago, and am now labouring through it: I find the situations repetitive with incremental changes between one and at the next; the characters flat and the story line predictable. And like you, I think of the daastani story teller narrating the story and how he would have infused the tale with much more richness than is visible on the page. However, I do want to get to the end so that I can have a wholistic view of the book, when I judge it and add it to my repertoire of reading. Your review has ignited hope in me again...and I will pursue the book with renewed vigour. @Dee: Thanks. Glad you found the review useful. Some narrative forms really love repetition. Take 1st person video games. All that really happens is the same event over and over -- see varmint, blast varmint-- but for a lot of people that's more than enough. A similar situation seems to hold for TV soaps. Odd stuff. Well, I am at page 312- 3/4ths of the way through the book, and I respectfully disagree with you on 2 points. Or perhaps it is better to say I have a different POV? Repetition for rhetoric and effect works fine...but not if it disconnects the reader. In video games it is the very act of doing something that gives the actor some sense of satisfaction. I know, because I play jewel quest fairly repetitively on my computer every day...and here the act of winning the game is what gets me to return. My second is the blasphemy about LOTR! Ha! I think what Tolkien managed extraordinarily well is to make the journey in itself so hazardous that it becomes a surrogate for the villain. In addition, there are many substitute villains: Saruman, the ringwraiths, Grima Wormtongue. They keep the reader riveted and the story moving relentlessly forward without stalling. In contrast- Afrasiyab is (as you said) the most developed of characters, but often reduced to a caricature. Afrasiyab and his team are no match for the true believers..not because they couldn't have been, but because the story doesn't let them be: and this I believe, is the heart of the problem...the book fails to rise to potential...and gosh, if it had, it would have been a soaring achievement. So while I admire and appreciate the genesis of Hoshruba...the story in itself- not so much.